To any thing, its impurity could be zero, in the other words, its purity is impossible to be 100%, even the 999 Sterling Silver, which is mixed into a little impurity as well. Therefore, there is always a limit range allowed to exist in the professional field. Then, to the lead free rhinestone, what is the limit range to the heavy metal? After the worldwide scientists did a lot of approving studying, they confirmed the lead free standard, it is the definition of 90ppm, if the content of Pb, Cd, Cr, Ni, Hg is over 90ppm, it is defined to be “fail”, which means to be not lead free; if less than 90ppm, it will be defined to be “pass”, saying that it meets the lead free standard. To be more straight, if using the chemical test way, it will be pass when the solute is less than 90mg in the 1000g solution. If it is still hard to understand the concept of 90ppm clearly, let us take a example of a child who did a lead content test for his hair. He is about 3 or 4 years old, and looks fine with everything except that he is too skinny and has a bad appetite. 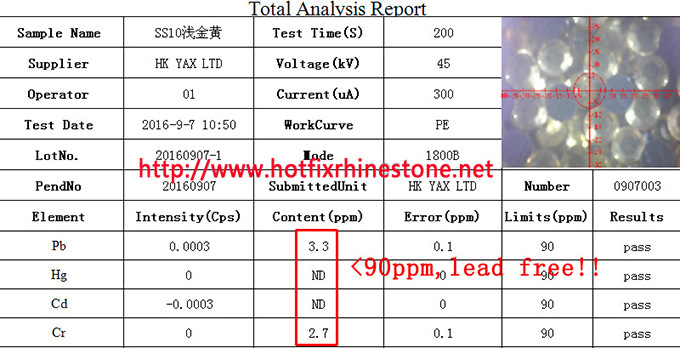 After the lead content test of his hair, it is found that the lead content is 700ppm! Apparently, compared to 700ppm, 90ppm is very very small. Therefore, the lead free rhinestone is defined that the content of Pb, Cd, Cr, Ni, Hg and so on the harmful heavy metals is less than 90ppm. 2018.1.1-2018.1.31,You will enjoy a great discount of our brand hotfix rhinestone Swainstone—40% DISCOUNT.